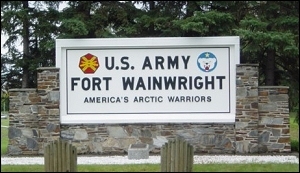 Fort Wainwright is located adjacent to Fairbanks in the interior of Alaska. The post is located in the North Star Borough. A borough in Alaska is equivalent to a county in the lower 48 states. Fairbanks, the second largest city in Alaska, is located 365 miles north of Anchorage, Alaska. You’ll find that the cost of housing and other living expenses in the Fairbanks area is very high. On post housing can be quite a wait and off-post housing is also very limited. The weather in Fairbanks has the largest swing in the world. It reach 90 degrees in the summer and a negative 65 degrees in the winter. Soldiers and their families assigned to Fort Wainwright will be able to enjoy breathtaking scenery abundant hunting, fishing and camping, regal mountains, diverse wildlife and the friendly independent people who will be their neighbors. The base operator’s phone number is (907)353-1110 or DSN (317)353-1110. Many political and military leaders advocated building military bases in Alaska several years prior to World War II. Finally, when war threatened in 1939, Congress granted $4 million to construct an Army cold-weather experimental station at Fairbanks. In 1961, the Army renamed the post Fort Jonathan M. Wainwright after the general who, with his men, valiantly defended the Bataan Peninsula during the first few months of World War II. Since then Fort Wainwright has been home to several units, including the 171st Infantry Brigade (Mechanized), a Nike-Hercules battalion, and the 172nd Infantry Brigade and the 6th Infantry Division (Light). In 2001, Fort Wainwright was selected as the third Stryker Brigade Combat Team and, in 2006, the post was selected as the home of Task Force 49 Aviation Brigade. Fort Wainwright’s mission is to deploy combat ready forces to support joint military operations worldwide and serve as the Joint Force Land Component Command to support Joint Task Force Alaska. Our strategic location, superior training capabilities and dynamic relationship with our local civilian communities make Fort Wainwright and United States Army in Alaska a significant national asset and world-class power projection platform for military operations anywhere in the world. Fort Wainwright has 5,108 soldiers stationed at Fort Wainwright, and 5,798 command sponsored dependents reside with those soldiers on post or in the surrounding community. Also, 915 civil service employees and 273 non-appropriated employees work at Fort Wainwright, for a total of 1188 civilians working on post. Armed Services YMCA (ASYMCA) has a free shuttle service on Fort Wainwright. This service is for Soldiers and family members. Call (907) 353-FREE/3733 to request a shuttle and the shuttle driver will take you where ever you need to go on Fort Wainwright. To obtain a sponsor at Fort Wainwright prior to your arrival, send your request to USARAK, ATTN: APVR-AG-SE, 600 Richardson Drive, Fort Richardson, AK 99505-5100, or call (907) 384-1970/1969/1967, DSN (317) 384-1970/1969/1967. If not being met by your sponsor, report to the Welcome Center, Building 3401. If arriving after duty hours, contact the Welcome Center at (907) 353-2273. If you need to send mail to Fort Wainwright, call 1 (800)-275-8777, ask for the post office on Fort Wainwright and then ask for their requirements for forwarding mail to Fort Wainwright. With the popularity of recreational travel to Alaska and the large number of official travelers, U.S. Army Alaska Lodging strives to offer the finest temporary lodging to both official and Space Available travelers. The popularity of Alaska means lodging is usually 100 percent booked from April through September. For the best chance of a successful booking, it is recommended that guests make reservations as soon as they are eligible. For reservations at Fort Wainwright’s Northern Lights Inn (Building 3402) call (907) 353-3800, 24 hours a day to reserve one of its 90 rooms. The Relocation Readiness Program is located in Rooms 58 and 59 of the Welcome Center, in Building 3401. Welcome packets, maps and other local information are available. Computers are available in the Family Readiness Center, also located in the Army Community Service area of the Welcome Center. The Relocation Lending Closet offers household items for 30 day loan. Fort Wainwright’s two-day long Newcomers Orientation is held from 0800-1500, every second Wednesday and Thursday of each month, at the Battle Command Training Center. For more assistance, contact us at (907) 353-4333/7908, DSN (317) 353-4227. Fort Wainwright is considered an overseas tour. If you have dependents and you want your family members to accompany you to Alaska, your PCS orders must say “concurrent travel” and have each family member’s name on your orders. Each family member must have completed the Exceptional Family Member screening and have Command Sponsorship. If your PCS orders say “deferred travel” for your family, then you need to travel to Alaska alone. After you arrive and sign into Fort Wainwright, you can begin the Command Sponsorship process. Have your family complete the Exceptional Family Member screening at the losing post and wait to hear from you for further instructions. 2-1 IN, 562nd Engineer Co.